Bishop LeBlond Memorial High School, founded in 1960 by the Benedictine Sisters of Atchison, Kansas, is a Diocesan comprehensive school, serving grades nine through twelve. LeBlond's mission as a Catholic, college preparatory school is to provide a top quality education by embracing academic excellence and promoting social and spiritual growth. LeBlond offers a uniquely diversified program in the St. Joseph area to develop students as lifelong learners--spiritually, intellectually, physically and socially. LeBlond’s comprehensive academic and co-curricular program encourages growth in religious faith, skill development and self-discovery; and aids in career selection. LeBlond is the only catholic high school located in Northwest Missouri and has been providing college preparatory education for the past 58 years. LeBlond is accredited by AdvancEd (formerly the North Central Association on Accreditation and School Improvement) and by the State of Missouri. Tuition: Tuition for 2018-2019 is $6,400 for a student whose family is registered in a Catholic parish and $6,700 for all other students. Scholarships and diocesan aid are available. No deserving student is denied because of finances. Faculty: Twenty-two faculty (including administrators), seven with Master’s Degrees and two with Doctorate Degrees. The student-faculty ratio is 12:1. Welcome to Bishop LeBlond High School's home on the Internet. We have tried to extend our community to the web and to make it a place you can continue to feel connected to LeBlond. Please look through our site and find information about our school and our alumni community. We hope you’ll find the information on this site useful. Please let us know if you have questions or ideas for additional information we can make available. We look forward to hearing from you. Drive for Excellence. Glory to God. Mission Statement - Our mission as a Catholic, college preparatory school is to provide a quality education by embracing academic excellence and promoting social and spiritual growth. Vision Statement - Bishop LeBlond High School, a co-educational Catholic school of the Diocese of Kansas City - St. Joseph, is founded on Christian principles and Benedictine tradition. Bishop LeBlond provides a college preparatory program that encourages growth in religious faith, fosters service to others and guides career exploration. Bishop LeBlond encourages participation in a host of extracurricular activities. Bishop LeBlond Memorial High School is the proud successor to the Convent of the Sacred Heart and Christian Brothers High School. Bishop LeBlond was founded in 1960 by the Benedictine Sisters of Mount St. Scholastica of Atchison, Kansas, as the all-girls school successor to the Convent of the Sacred Heart. In 1970, when Christian Brothers High School for boys closed, Bishop LeBlond became co-educational. The founding principles and missions of both predecessor schools remain alive at Bishop LeBlond High School, though the school is now a diocesan high school of the Diocese of Kansas City-St. Joseph. Bishop LeBlond High School was named to honor longtime St. Joseph Diocese Bishop Charles H. LeBlond who was very popular with both Catholics and non-Catholics alike. Bishop LeBlond became co-educational in 1970. At the time it became coeducational, Sr. Mary Agnes McPhee O.S.B., was principal and Don Tabor, who had been football coach at Christian Brothers was LeBlond's first athletic director. Bishop LeBlond assumed the mascot of the Golden Eagle and the school colors of purple and gold which had been the standards at Christian Brothers. Because Christian Brothers had been known affectionately as "CB," the shortened form for Bishop LeBlond became "LB" to retain the rhyming scheme for cheers, etc. The Convent of the Sacred Heart was the first Catholic school in St. Joseph, Mo. The "Academy of the Sisters of the Sacred Heart" received its charter from the Missouri legislature on December 13, 1855. The shining dome on top of the Convent became a St. Joseph landmark for captains of steamboats on the Missouri River. 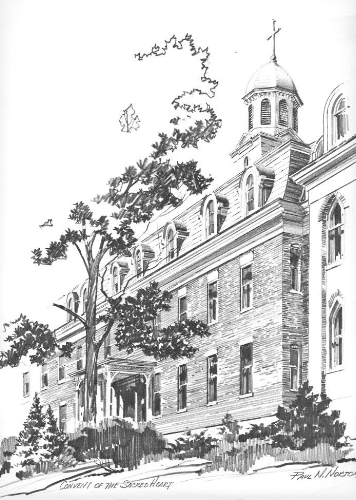 In 1901, at the request of Bishop Burke, the Sacred Heart opened Cathedral School for elementary students. 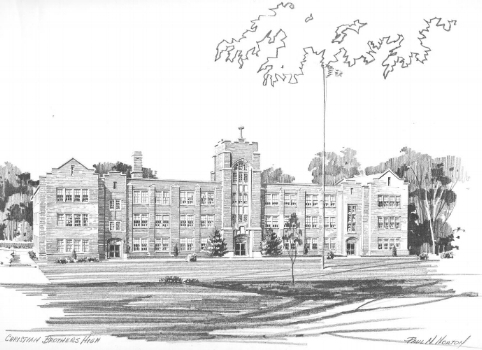 In 1920 the Convent opened at 12th and Messanie as a day school; the Sacred Heart nuns left Cathedral School and the Benedictines took over its operation as an elementary school. In 1959 the Benedictine nuns agreed to open a new girls' high school and the Convent was allowed to close. There were 60 girls in the final graduating class in 1960-- the 104th commencement for the school. Christian Brothers High School was opened in 1867 in St. Joseph. The school had been built in 1860, but had been used as a hospital for Union troops during the Civil War. 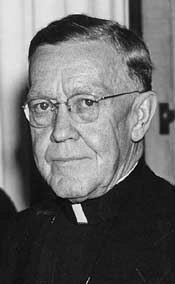 Father Thomas Scanlan, who had been instrumental in bringing the Sacred Heart nuns to St. Joseph, asked the Christian Brothers to open a similar school for boys. Christian Brothers provided Catholic education to the young men of St. Joseph for 103 years, closing after graduation exercises in 1970. Local news coverage of the closing noted that CB had been known for excellent discipline, colorful athletic teams as well as the outstanding education they offered. Enrollment at the time of the closing was 274, about 100 less than it had been six years prior. Interested in a career at Bishop LeBlond?